History: The Jaguar King was the ‘runt’ of a noble family and rose to the position of king through the traditional trial by combat. As the King of South America, he gained access to many of the nation’s secrets, such as enchanted weaponry and armor, as well as the blessing of the Jaguar God. In a leadership based on hand-to-hand combat, these weapons made Carlos and his already impressive skills unstoppable. His lengthy reign ushered in a new era of prosperity for the nation. Carlos soon caught the eye of The High Council, and was recruited to lend his skills to saving the multi-verse. He accepted the Council’s offer; appointing a regent to rule the country during his frequent absences. Carlos’ skills shone as part of the Superpower Union, where his skill more then made up for his small stature. Thanks to the enchantments in his weaponry, Carlos is blessed with an unnaturally long life, and in the centuries of service in the union, has rose to become a member of the High Council. 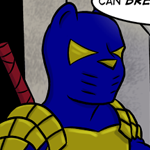 Even though he holds such a high position in the Superhero community, Carlos maintains a solid presence in his homeland, and has become the most powerful figure on his home world.